Do you know what today is? It is my one year blogiversary. One year ago I posted for the first time on Snickety Things with how I made a tutu for a cake board. 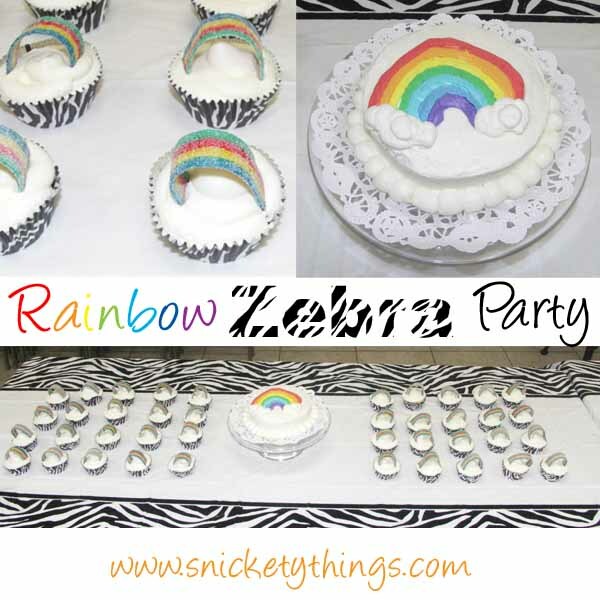 It is only fitting that today I am once again talking about a rainbow party. 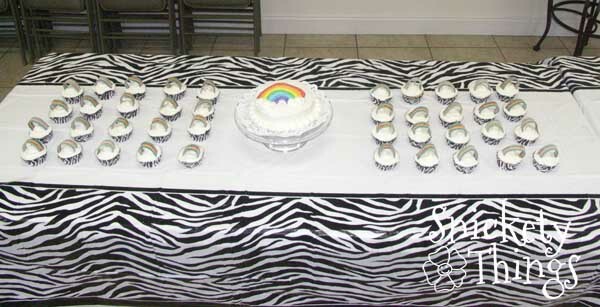 Or make that a rainbow-zebra party. Boo gives me such challenging party themes. I had grand ideas on how this theme would play out. Life, once again, had its own ideas. My mother-in-law received a pace maker just after Christmas and had a heart attack just a few days before Boo's birthday. We weren't even sure we would be having a party. Thankfully, she is recovering and our party was able to go on, just not quite as originally planned. First, the party was moved from our house to our church's fellowship hall. This was a tremendous help to us since we barely got our Christmas decorations put away and the house is still in disarray. Fortunately, our church is next to a city park and playground so we were able to allow the kids to play there during the party. This was great because we had just come off of two weeks of rain followed by a snow storm. Of course this being south Mississippi, the snow lasted an hour and was completely melted an hour after that. And being two days after the snow it was already 60 degrees out. The kids need the time to run. 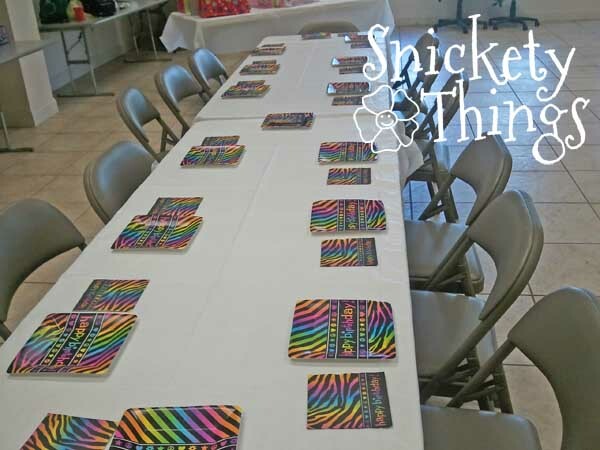 Our invitations asked that everyone dress in zebra stripes or their favorite color. 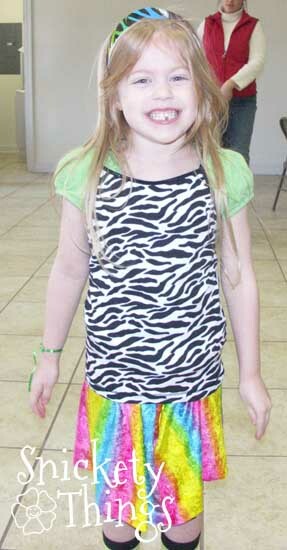 Boo chose to dress in the rainbow skirt she used for her birthday party last year, zebra leggins, a green shirt (her favorite color), a zebra tank and rainbow striped socks. I was even able to find a headband that had a rainbow background and zebra stripes. 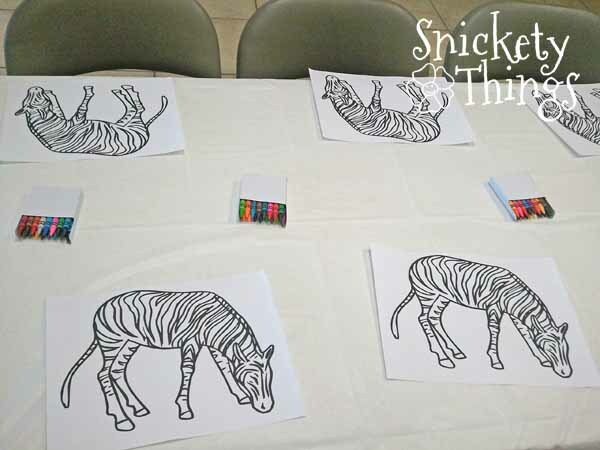 I put out blank pictures of a zebra for the kids to color to help wind down from running before we had the cake. This actually turned out to be very popular with the kids (and some of the adults). They spent about twenty minutes coloring quietly before their attention started drifting towards the cake. 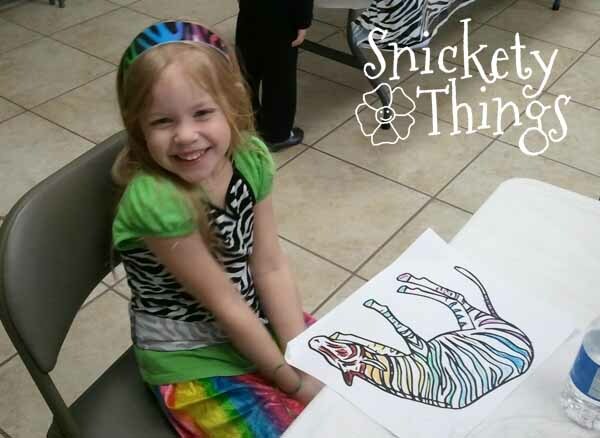 Here is Boo with her finished zebra. It was actually easier than I thought to find plates that had a rainbow zebra theme. A local party supply store had some on clearance (score!). They are actually part of a rock-n-roll party set. Here is the set up for the cake. I only made a six inch cake for Boo and cupcakes for everyone else. My intention had been a more elaborate cake, but I scaled it down. 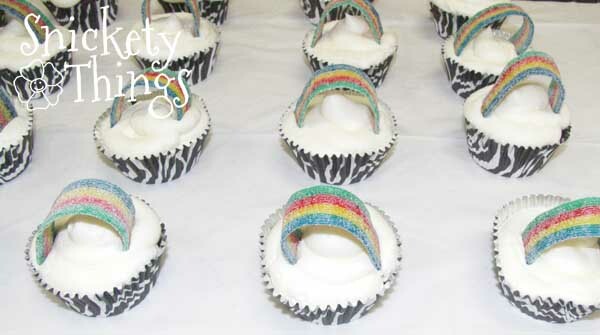 The cupcakes are in a zebra liner and topped with a sour patch strip. If you do this, put the strips on just before the party starts. Any longer than a couple of hours and the strips will sag down and flatten, not giving the great arch. 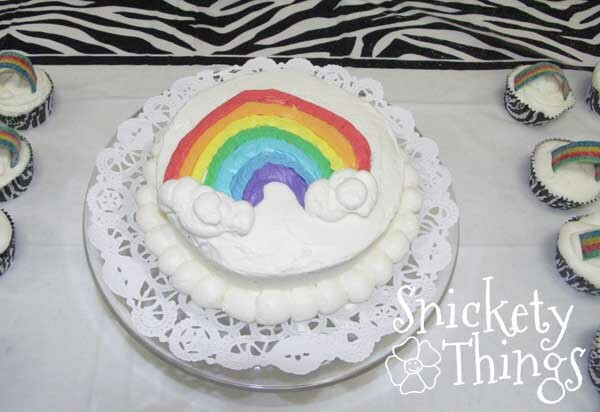 The six inch cake was topped with an icing rainbow. Topped with zebra candles I found at Walmart and the birthday girl was very happy. Her real surprise came when I cut the cake. I had made the inside zebra striped. 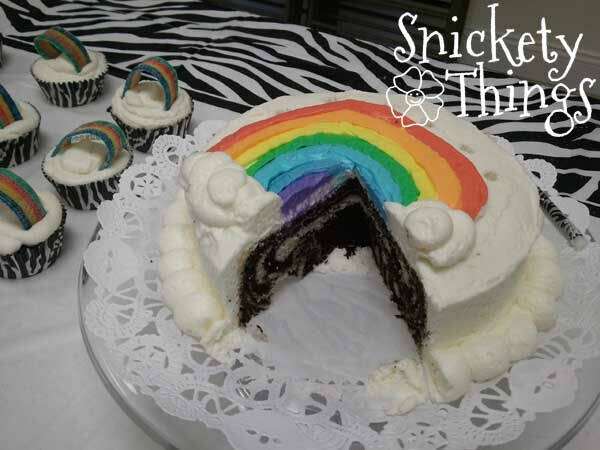 I'll be making a post soon on how I made the cake and why the stripes aren't as pronounced as I hoped they would be. Boo still liked it though. I want to thank everyone for following Snickety Things this past year. I love hearing your comments. Don't forget to follow Snickety Things over on Facebook to learn when new posts go up or get sneak peeks of projects. I'm also 21 days into my photo 365 project on Instagram. I'll be posting January's at the end of the month or you can see them as they go up in my Instagram feed. Look for RenondaB on Instagram. What a fun and creative party idea! 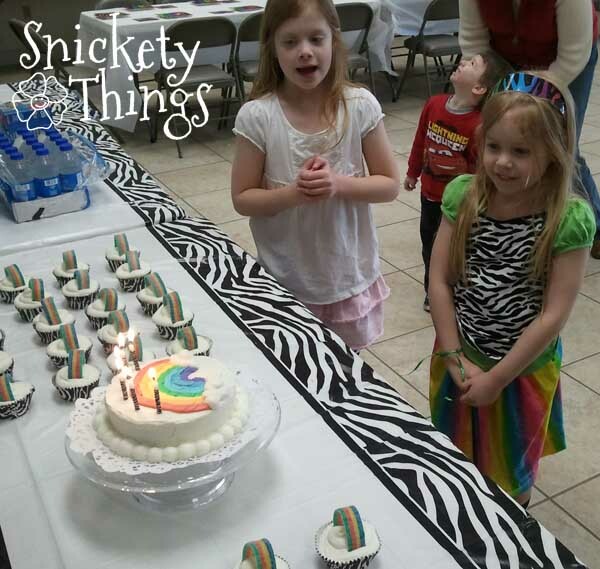 I love the stripes in the cake and the rainbows on the cupcakes - too cute! What a fun looking party! I love the birthday girls outfit and that cake looks fabulous, I'd be proud if my cake turned out so nicely. I'm sorry you weren't happy with it! 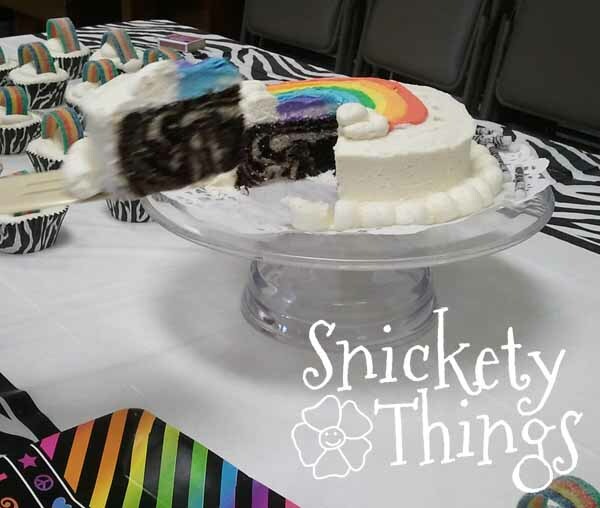 Thanks for sharing on A Crafty Soiree! Thank you! She has worn that outfit twice and I bet she would wear it to school if she didn't have to wear a uniform.